A great knight of the Crusades would not have been fully armed without his sturdy steel helmet. Perfect for safety and comfort during reenactment, the Flat Top Crusader Helm will also give you the authenticity you are searching for. 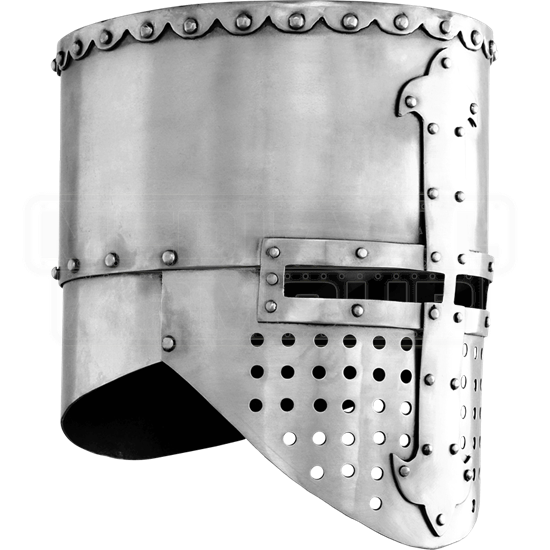 Made from 14 gauge steel, this helmet is lined to provide you with a more comfortable fit during battle. Large ventilation holes allow for easy breathing and cooling, while a reinforced nasal enhances safety. The fleur de lis shaped cross on the face of this helm adds an authentic touch as well. The flat top helm dates from the 12th to the 13th century, and it was ideal for providing full face protection before the introduction of the visor. The Flat Top Crusader Helm will add the finishing touch you need to complete your Crusades era armor.